Anointing, also called Unction, is the pouring of oil on an item or body part, often the head. Sometimes animal fat or melted butter is used. The process is employed in several sacraments of the Orthodox and Catholic Christian churches and is exercised ritually by many other religions and ethnic groups. People and objects are anointed to mark the introduction of a sacramental or divine influence, a holy emanation, spirit, or power. Anointing can also be used as a mode of ridding persons and things of dangerous spiritual influences, such as diseases and especially demons. In Hebrew, the term of an "anointed one" is mashiach, from which the term "Messiah" is derived. The Greek translation of this word gives us the English term "Christ." 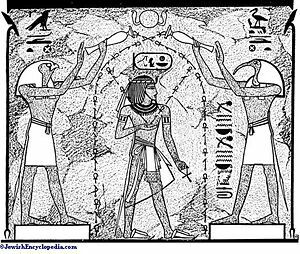 Jewish, Egyptian, and other ancient kings were often anointed, and in western history, anointing has been used as part of the royal coronation ceremonies, symbolizing a divine blessing upon the monarch. 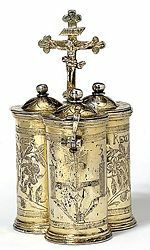 In Christian tradition, the anointing oil may be called chrism. 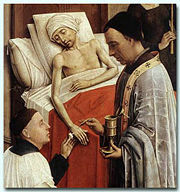 Formerly known as Extreme Unction, the Catholic and Orthodox sacrament Anointing of the sick is not to be confused with the "last rights," which includes not only unction, but also the sacraments of Penance and Viaticum, a form of Holy Communion. Thetis anoints Achilles with ambrosia. The indigenous Australians believed that the virtues of a dead person could be transferred to survivors if they rubbed themselves with his or her intestinal-fat. Similarly, the Arabs of East Africa anointed themselves with lion's fat in order to gain courage. Human fat was considered to be a powerful charm all over the world. The fat was often thought to be the vehicle and seat of life, second only to the blood. This, in addition to the "pleasing odor" produced, resulted in the fat of a sacrificial animal victim being smeared on a sacred altar to honor the deity. According to some beliefs, the qualities of divinity can, by anointing, be transferred into men as well. 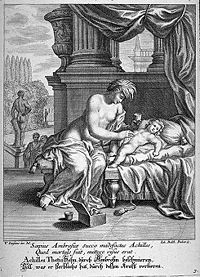 In Greek mythology the sea nymph Thetis anointed her mortal child Achilles with ambrosia in order to make him immortal. 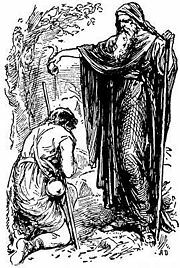 (In a variant of the myth, Thetis dipped him in the waters of the River Styx but failed to dip the heel by which she held him). Among the Jews, as among the Egyptians and other peoples, kings were anointed with olive oil in token of God's blessing upon them. Butter is often used for anointing in the Hindu religion. A newly built house is smeared with it; so are those believed to be suffering from demonic possession, care being taken to smear the latter downwards from head to foot. Anointments are also part of certain Hindu monarchies' enthronement rituals, when blood can also be used. Samuel anoints David as Israel's future king. Previously, Samuel had performed the same ritual with Saul. 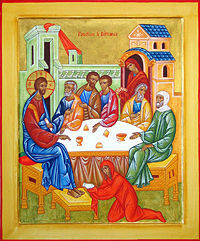 Among the Hebrews, the act of anointing was significant in consecration of a person or object to a sacred use. In the Hebrew Bible, the high priest and the king are both sometimes called "the anointed" (Leviticus 4:3-5, 4:16; 6:20; Psalm 132:10). Prophets were also sometimes anointed (1 Kings 19:16; 1 Chronicles 16:22; Psalm 105:15). Earlier, God identifies himself to Jacob by reminding him of the sacred pillar that Jacob anointed at Bethel: "I am the God of Bethel, where you anointed a pillar and where you made a vow to me." (Genesis 31:13) In Exodus 40 and Leviticus 8, Moses is described as anointing the sacred altar and even the entire Tabernacle and all its furnishings and utensils with scented oil. Anointing a king was equivalent to crowning him in terms of authority. In fact, a crown was not required (1 Samuel 16:13; 2 Samuel 2:4, etc.). Oil was used also for medicinal purposes. It was applied to the sick, and also to wounds (Psalms 109:18; Isaiah 1:6). It was also the custom of the Jews to anoint themselves with oil, as a means of spiritually refreshing themselves or invigorating their bodies (Deuteronomy 28:40; Ruth 3:3; 2 Samuel 14:2; Psalms 104:15, etc.). The Hellenes had similar customs. This tradition is continued among the Arabs to the present day and may be compared to the custom of many modern people to give themselves various types of oil-based skin treatments. The expression, "anoint the shield" (Isaiah 21:5), refers to the custom of rubbing oil on the leather of the shield so as to make it supple and fit for use in war. The terms "Messiah" and "Christ" are English and Greek versions of the Hebrew Mashiach, meaning "anointed one," originally referring to the Messiah's position as an anointed Davidic king who would restore the ideal of the Israelite monarchy centered on God's law. Christians particularly emphasize the idea of the "anointed one" as referring to the promised Messiah in various biblical verses such as Psalm 2:2 and Daniel 9:25-26. The word Christ, which is now used as though it were a surname, is actually a title derived from the Greek Christos, meaning "anointed," and constituting a Greek version of the his title Jesus "the Messiah." However, in Christianity, Jesus is understood to be "anointed" not by any physical substance or human agency, such as a priest or prophet, but by virtue of his predestined messiahship. In Luke 4:18 Jesus indicates a prophetic anointing directly by God: "The Spirit of the Lord is on me, because he has anointed me to preach good news to the poor." Acts 10:38 speaks of how "God anointed Jesus of Nazareth with the Holy Spirit and power, and how he went around doing good and healing all who were under the power of the devil, because God was with him." Nevertheless, the Gospels do state that Jesus was physically "anointed" by an anonymous woman who is interpreted by some as Mary Magdalene in Luke 7, and later by Mary of Bethany, shortly prior to his death (John 12:3). Jesus' female disciples are described as intending to anoint Jesus' body after his death when they discovered his empty tomb (Mark 16:1). The Apostle Paul speaks of God's anointing on himself and his companions Timothy and Silas: "He anointed us, set his seal of ownership on us, and put his Spirit in our hearts as a deposit, guaranteeing what is to come." (2 Cor. 1:21-22) In the Book of Acts, the imparting of the Holy Spirit to believers came to be associated sometimes with baptism and also with a separate experience of receiving the Holy Spirit through the gift of "tongues." Hebrews 1:9, quoting Psalm 45, speaks of God anointing Christians with the "oil of joy." 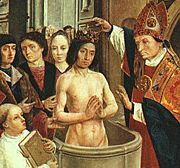 Catholic and Orthodox churches incorporate anointing into the sacrament of baptism, as do some Protestant churches. In Roman Catholic and Eastern Orthodox usage, anointing is part of the sacrament of anointing of the sick (in Orthodox terminology the mystery of unction). Consecrated oil is also used in confirmation, and holy orders, as well as in exorcisms. Usually olive oil is used, but another vegetable oil may be used. It is blessed by the bishop of the diocese at the Chrism Mass celebrated on Holy Thursday or on a day close to it. The Orthodox routinely administer unction not only for physical ailments, but for spiritual ills as well, and the faithful may request unction at will. It is normal for everyone to receive unction during Holy Week. Anointing with oil is used in Pentecostal churches for healing the sick and also for consecration or ordination of pastors and elders. The word "anointing" is also frequently used by Pentecostal Christians to refer to the power of God or the Spirit of God residing in a Christian. While the Byzantine emperors from Justinian I onward considered themselves anointed by God, in Christian Europe, the Merovingian monarchy was the first known to anoint the king in a coronation ceremony that was designed to epitomize the Catholic Church's conferring a religious sanction of the monarch's divine right to rule. The French Kings adopted the fleur-de-lis as a baptismal symbol of purity on the conversion of the Frankish King Clovis I to the Christian religion in 493. To further enhance its mystique, a legend sprang up that a vial of oil descended from Heaven to anoint and sanctify Clovis as king. Charlemagne was famously anointed and crowned by Pope Leo III in 800 C.E. In the Byzantine Empire, the ecclesiastical rite of anointing the emperor by the patriarch of Constantinople was incorporated in the twelfth century. The anointed kings of France later maintained, as had their Byzantine counterparts previously, that their authority was directly from God, without the mediation of either the Emperor or the pope. English monarchs also included anointing in their coronation rituals. A record exists indicating that for the coronation of King Charles I in 1626, the holy oil was made of a concoction of orange, jasmine, distilled roses, distilled cinnamon, oil of ben, extract of bensoint, ambergris, musk, and civet. Since anointing no longer symbolizes the king's subordination to the religious authority, even in Catholic countries, it is not performed by the pope but usually reserved for the (arch)bishop of a major see. Hence the utensils of anointing can be part of the royal regalia. This page was last modified on 23 September 2008, at 17:51.